Back in my college days, every morning I walked through the art studio doors a favorite art professor of mine would start singing the classic Tony Bennett tune “Just in time. I found you just in time…” followed by a friendly greeting: “Justin!” More than 20 years later and I still find myself humming that little refrain when I’m thanked by a colleague or parent for helping them find what they need when they need it. On my finest days, I sometimes find what they need before they even know they need it. To me, that’s the essence of a librarian’s role. Just-in-time, on-demand access. Access to help, to information, to guidance, to solutions, to a partner, to further questions to answer. Triggering Question: What role can librarians play in providing professional development in the digital age? I have 26 classroom teachers in my building and 26 librarians in my district. There seems to be not enough time in the day to make the in-person connections that are necessary to support professional development needs as they arise. Much as I’d love to be able to drop everything and help my colleagues whenever the librarian bat-signal is lit, the reality is I’m often tethered to my library unable to provide these needed supports. As a result, I often wonder what is a realistic professional development role for a librarian in the digital age and how can I break through barriers of time and communication? I have not yet mastered the art of time travel. And, by extension, I guess that admission is proof that I haven’t figured out how to manipulate the space-time continuum in the future either. Faced with the knowledge that time is a fixed resource, how can I as a librarian make the most of it? By using these resources I haven’t defeated time’s relentless onslaught, but I have found ways to minimize waste along the way. Often compared with OneNote or Evernote, Google Keep is a bit of a fringe application in the Google suite of tools (always a scary place to be, as those seem to be the tools that the Mountain View giant usually axes), and it’s a deceptively powerful one. At its most basic level, with a click or tap you can quickly save/bookmark/share/tag websites and other resources. These two brief articles highlight some of the lesser-known and powerful features. Keep could be a great way to deliver resources and content to staff in real-time. Saving resources for later usage (and tagging them for easy reference) could maximise training opportunities, and its G Suite integration could provide for some great opportunities for digital collaboration. So, how does this resource relate to time? I’ll share an example… Too often when we attend a training, they’re one-and-done affairs. Sit in front of the firehose of information for 50 minutes, then walk away with a vague recollection of the resources shared. What about if the presenter had instead shared a link with all of the resources? It would make it easier to revisit after the fact, make it easier to share with colleagues who weren’t able to be present, make it easier to participate in the conversation rather than focusing on note-taking, make it easier for audience members to add to the list of resources. Is Google Keep the best of these types of applications? Maybe not, but it is definitely one of the more accessible ones. Every time I show Keep to a colleague, no matter how brief and rudimentary my introduction their eyes sparkle as they start to think about how they could use the tool in their work. There are a plethora of screen capture and screencast tools, but NIMBUS is about as barebones and fully-featured as I’ve found, with the added cost bonus… Free! I’ve primarily tried out the Chrome extension. As it’s Chrome-based, there’s no need to install software on the different devices I use throughout the day which means the tool is available no matter where I’m sitting (standing, crouching, crying quietly in a corner while rocking, etc.). I’m cheating. The theme of this blog post is saving time. These resources are supposed to be time savers. This one is not. In fact, I haven’t come across a bigger time sink in recent memory, and it keeps growing! In reality, though, the Future Ready Schools initiative (http://futureready.org/) is amazing resource worth exploring. Their goal: “When high quality teaching is infused with the dynamic use of technology, personalized student learning becomes possible. The Future Ready District Pledge is designed to set out a roadmap to achieve that success and to commit districts to move as quickly as possible towards a shared vision of preparing students for success in college, career, and citizenship.” Even better, the Future Ready Librarians framework follows the same model allowing for embedding librarians into conversations and decision-making at an administrative level. Though I joke about the time sink, I’m actually very excited about the opportunities that may emerge from Future Ready Librarian program. The focus is on personalized learning. Interestingly, The Bill & Melinda Gates Foundation’s 2014 report on professional development, Teachers Know Best: Teachers’ Views on Professional Development highlights the perceived value of time and of an individualized and personalized approach to professional learning. Of the eleven barriers provided in their report, the three top-cited barriers were those that mentioned and focused on time. Short-term goal… use tools like Google Keep and NIMBUS to share resources and knowledge with colleagues. 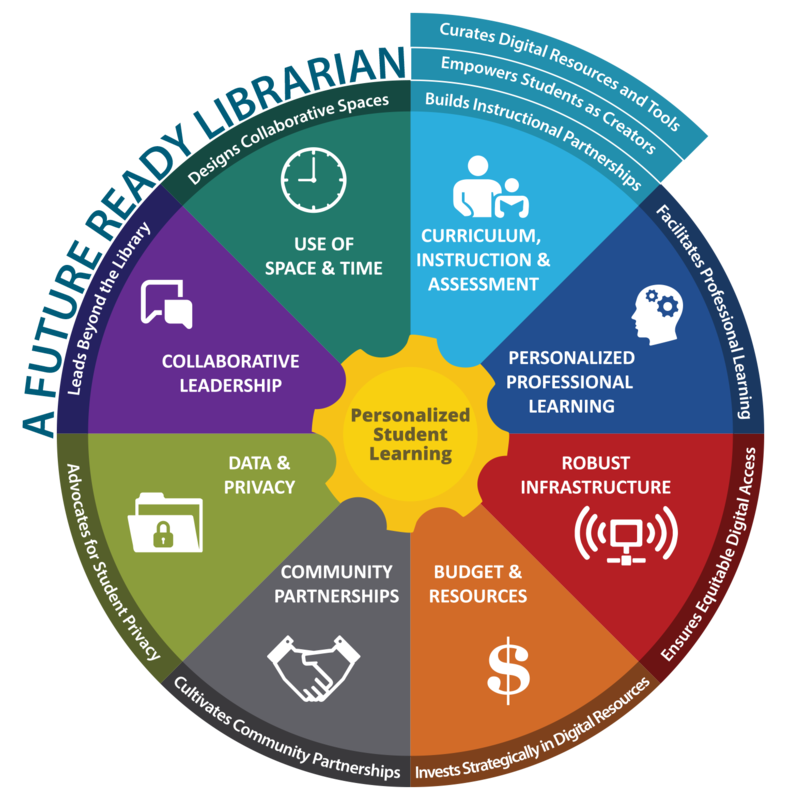 Long-term goal… utilize the Future Ready Librarian framework to leverage embedding librarians into administrative-level discussions and planning regarding professional development and teaching. Slightly longer-term goal… create a time machine. Lewis, K. R. (2016, April). The school librarian and leadership: What can be learned? Teacher Librarian, 43(4), 18-21. Justin, I like how you brought attention to some tools that allow for asynchronous just-in-time technology help! While I’ve used Google Keep, I had not thought of using it in this way. Thanks for sharing!